The driver had his 3 year old son on the crane with him. When Mr Tree went to put a chain around a pole he saw sparks jumping from the crane’s tyres and that the jib of the crane was in contact with the powerline. The driver jumped clear and went to remove his son, who at that time was in a boxed section and not coming into contact with electricity. Sparks were arcing beneath the crane to the ground and twice Mr Tree stopped the driver from going to the truck. He warned him not to touch the boy as he knew that the crane was alive with electricity and that he would be electrocuted. He went to get a rope and turning round he realised that the driver must have attempted to rescue his son, as he had electricity arcing through his body and was being electrocuted. Mr Tree pushed him clear and fell to the ground unconscious having himself been electrocuted. Regaining consciousness Mr Tree saw the boy standing between the tyre and the mudguard with electricity entering his head near his right ear, passing through his body and also entering near his left elbow. Knowing that the boy was about to be fatally electrocuted he pulled him clear and again lost consciousness having been electrocuted once more. When he regained consciousness on the second occasion he found that neither the driver nor his son was breathing. On his own, as he had sent his nephew for the ambulance, he gave mouth the mouth resuscitation to them both. The boy responded, but in spite of Mr Tree’s further attempts to give the father cardio-pulmonary resuscitation, he died before medical assistance arrived. Mr Tree comforted the boy and drove him to meet the ambulance. He then followed the ambulance to the hospital at Elleston and was later flown to Adelaide for treatment. In saving the boy’s life Mr Tree had 19 stitches inserted in his left arm, 37 stitches to his back, 5 stitches on his right foot and 5 stitches on his left foot. One toe on his left foot was amputated and he had received burns to his back. 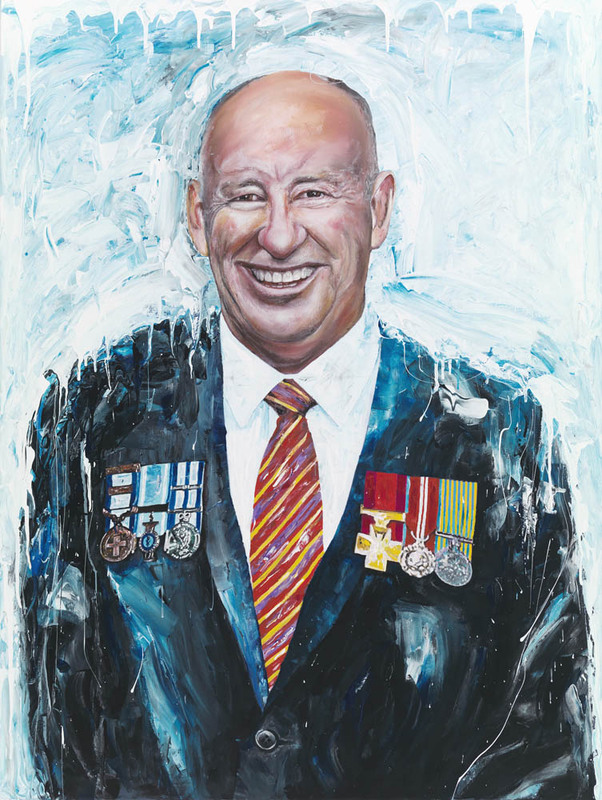 On the morning of 13 September 1993 in the northern suburbs of Brisbane Mr Victor Boscoe witnessed an armed hold-up and repeatedly placed his life in danger by pursuing two armed men fleeing from the scene with the proceeds of the robbery. Although he had heard a shot fired, Mr Boscoe followed the offenders to the car park and identified their ‘getaway’ vehicle. He pursued the vehicle in his own car through difficult traffic conditions and maintained visual contact. The offenders changed cars, observing Mr Boscoe in the process. Mr Boscoe continued his pursuit at high speed. Unable to elude their pursuer, the offenders stopped their car and threatened Mr Boscoe with a shotgun and a handgun. Mr Boscoe immediately rammed their car. Several shots were fired at him. Despite his wounds from the shotgun and glass and metal fragments Mr Boscoe was able to manoeuvre his vehicle free and to continue his pursuit of the offenders, through another change of vehicle, until forced to stop because of the damage caused to his car by the act of ramming. Mr Boscoe suffered injuries to his shoulder, arm and hand. As a result of his courageous efforts and presence of mind Mr Boscoe was able to provide Police with a useful description of the armed robbers, which assisted in the subsequent conviction of the principal offender. About mid morning on 3 May 1996, Mr Allan Sparkes rescued a boy trapped in a flooded underground storm water drain following record rainfalls at Coffs Harbour. Mr Sparkes and a police colleague responded to an urgent call for assistance to rescue a boy trapped in a flooded storm water drain. From the entrance of the drain, an object, believed to be the missing child, could be seen about 80-100 metres along. Tied to a rope, Mr Sparkes entered the drain and was rapidly washed 20 metres along the pipe by the ferocity of the current before realising the rope was inadequate. With a more substantial line, he re-entered the drain even though breathing space in the pipe had reduced due to rising flood waters and his own bulk displacement. Floodwaters washed him some 80 metres downstream before he could establish that the object was only debris. The drain was now almost totally engulfed in floodwater leaving only a small air space and Mr Sparkes was in danger of drowning as frantic attempts were made by his colleague and others to haul him against the flow to the surface. Although believing the child had little or no chance of survival, screams were heard further downstream in a pipe under a section of the Pacific Highway at the junction of six drains. Believing that the child was drowning and had to be rescued by the fasted means possible, Mr Sparkes and his colleague entered the flooded pipe in total darkness without a life line, torch or emergency air supply. As it was impossible to call to the child above the roar of the floodwater, the rescuers separately searched the maze of water pipes. After progressing deeper into the drainage system Mr Sparkes could hear the desperate screams more clearly and believed he had located the boy’s position. It was agreed that his colleague would search at ground level for a manhole closer to the child to facilitate a faster rescue. An ambulance officer then descended into the drains and remained in the flooded junction area to assist Mr Sparkes. Mr Sparkes secured a rope to himself and with the aid of a torch crawled back against the flow, finally making contact with the child and managing to calm him. By this stage Mr Sparkes was 30 metres from the pipe opening and 3 metres underground. Mr Sparkes managed to coax the boy into letting go of debris, and allow himself to be washed down the drain to where Mr Sparkes could grab and secure him. Mr Sparkes then placed the boy in front of himself and they were both washed down the pipe to the waiting ambulance officer. Mr Sparkes suffered lacerations and abrasions to his back and shoulder and cuts to his fingers and feet from forcing his way against the flow. Throughout the rescue Mr Sparkes was aware that he was in grave danger of losing his life as he believed that the whole storm water system was only minutes away from again being totally engulfed with floodwater. At approximately 11.30pm on 12 October 2002, following a terrorist bombing in Bali, Constable Timothy Britten and Richard Joyes placed their lives in danger by repeatedly entering the burning Sari Club to rescue a seriously injured woman and to search for survivors. After the explosions of the bombing of the Sari Club, the building was reduced to a burning shell and large numbers of burned and seriously injured people were lying on the roadway and footpath. On being told that a woman was trapped in the building, Constable Britten ran into the burning Club and made his way through the debris as gas cylinders exploded all around him. He managed to locate the severely injured woman, but was forced back by the intense heat and flames. He returned to the street and sought help from a man who was there searching for his friends. Constable Britten, wearing only a light singlet top, shorts and thongs, ran back into the burning building with Richard Joyes to try to rescue the woman but, having no protective clothing, was forced back by the intensity of the flames. Outside the Club, they were doused in bottled water and together ran back into the building to rescue the woman. On this attempt, they managed to reach the woman, who was still conscious but pinned down by rubble and a piece of iron. Throughout this time and later in searching the building for other survivors, Constable Britten was aware that he was in danger of being severely injured at least and possibly, of losing his life, as he believed that another explosion had been planned by the terrorists to disrupt rescue efforts and kill emergency workers. Despite this constant fear and severe burns to his arm, Constable Britten persisted in the rescue until the woman was prised free and could be pulled from the wreckage. The men carried her out of the Club and placed her on a truck to be taken to hospital. They then both went back into the burning building to look for more survivors, but could see only dead bodies. Although they wanted to continue entering the building to retrieve the bodies of victims, he was prevented by the growing intensity of the fire and further gas explosions. Over the next hour, Constable Britten and Mr Joyes carried the badly wounded from the street outside the club to waiting trucks. At one stage, they were stopped at gunpoint by an Indonesian police officer. It was only when Constable Britten produced his police identification that the two men were allowed to continue their rescue efforts. Constable Britten remained at the site helping Indonesian police and security guards, and only when he felt assured that emergency workers had the Sari Club site secured did he return to his hotel. On that night, Constable Britten and Mr Joyes selflessly placed themselves in constant danger.